I must confess that I was more interested in finding out about what happened to my great-grandmother Charlotte Ann McMurray Boardman than learning about my great-uncle William. In order to find Charlotte, I had to study what happened to him. “…Today is Saturday Feb. 21, 2004 and we are headed to the Central Library of Los Angeles. I was told not to take anything of value to this library, so I am leaving my computer at the hotel.  I hope to find more obituaries and do more city directory research. We will see. I was told it is a good library back in 2003 by the very helpful attendant at the Laguna Nigel NARA Branch (moved). Well the Los Angeles Public Library is really something to see. It is terraced and the History and Genealogy department is located on the bottom floor a long way underground. You go down, down, down and down some more on the escalator. You can get around by elevator once you know what you are doing, but try the main hall escalator for it is really amazing, the giant chandelier’s adorn the hallway and it was very impressive. The outside of the building looks like the 1930’s maybe 40’s in its style and they maintained the integrity of that older style. The collection of directories is impressive and well used for it was all messed up. I searched for Boardmans in these directories. Try this link to find LAPL research guides on a variety of topics of great interest including genealogy: http://www.lapl.org/resources/guides/ The research guide on genealogy describes their city directory collection and more. It is time for a confession regarding the following city directory research. My husband helped me while I did other things. Looking at his research notes now, I find that it is a little confusing as to whether he used microfilms or actual city directory books. We think he used the microfilms at NARA and books at the LAPL. The research got a little mushed between the two archives. It can happen. I recommend to take the time to be clear and in this case I should have gone over my husband’s results and made notes. So the sources are simplified below for each year given. 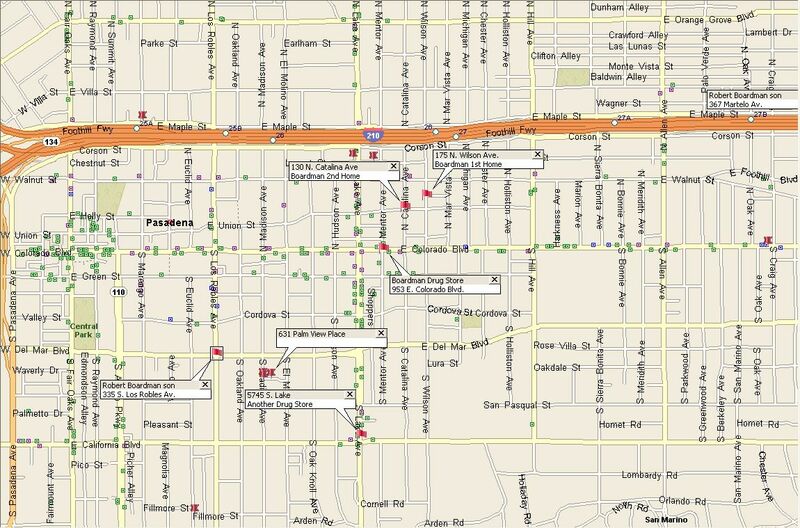 The Map above is of Pasadena today and is from my Microsoft Streets & Trips software. Click on the photo and it will open up bigger, then hit your back button to return, or close your tab depending on your browser. This map refers to the listing below. I was able to find most of the addresses except Mulberry and Burton. I suspected in building the 210 Freeway (Foothills) they took out streets. It means I need to find a map before the 1960’s to show me were these missing streets would be. The red flag is for my Boardman Family over the years. The red pushpin shows some of the other Boardman’s that show up in the city directory over time. I did not do all of these people and addresses as I have listed below. Boardman Charlotte A (wid Edmund) r130 N Catalina Av. Pasadena City Directory 1929 pg. 137 – City Directories of the United States, #46908 Pasadena. CA 1928-1929, NARA. Pasadena City Directory 1930 pg. 137 – City Directories of the United States #46909, Pasadena, CA 1930, NARA. Pasadena City Directory 1931 pg. 129 – Ciy Directories of the United States #046910, Pasadena, CA 1931, NARA. Wm. T. (Alice E) (Boardman’s Drug Store) h130 N Catalina Av. Boardman Geo E (Mildred) emp SFRy h617 Palm View pl. I do not know who Albert and Florence are and how they might relate to my Boardmans if at all. According to census they were born in New York. I was hoping for a Canadian link. It is interesting to follow this unknown Boardman family through the years and see their descendants appear. They are the family that appear on Mulberry Street which I cannot locate on today’s map. Focusing in on my Boardmans we see that Charlotte is listed from 1924 to 1930, then she disappears from 1930 till she reappears in 1937. She is listed for 1936, 1937 and 1938 and then disappears totally. She died in 1938. 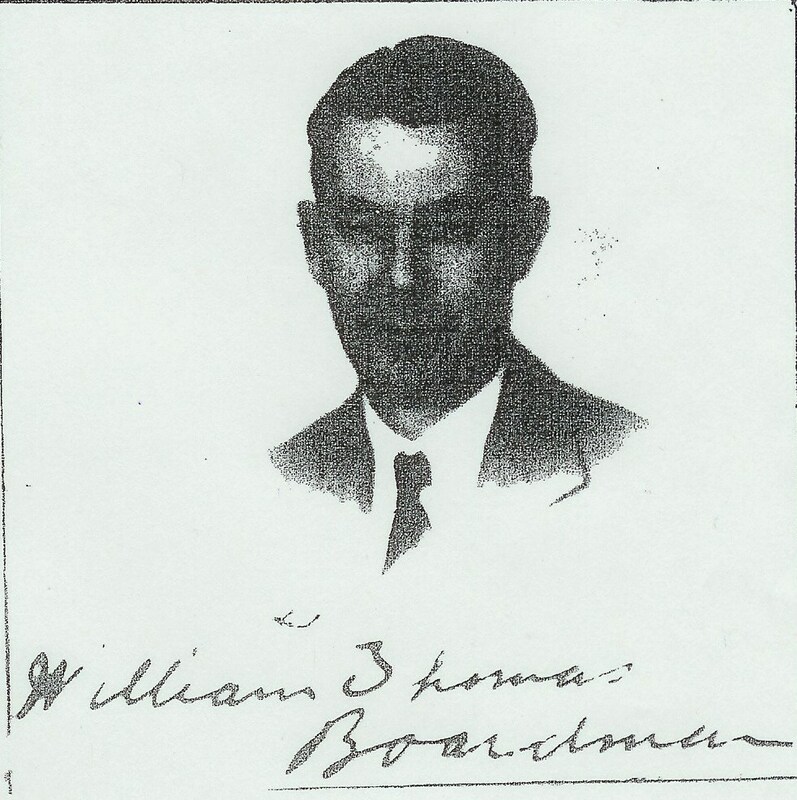 William T. Boardman is gone in the 1947 directory. He died in 1945. We have the two sons appearing in 1934, Robert and William so they have come of age. An interesting thing happens with William. He first appears with Margaret as a wife and then he disappears and comes back with Jean as a wife around 1940. I cannot get a fix on him in the 1940 U.S. Census. The family starts on Wilson Ave. and then moves to Catalina and later to Martelo Avenue as the years go by. The name and address of their drug store changes which is very interesting. There are quite a few leads that could be followed up on regarding the findings from the city directories such as marriages, divorces, mortgages, store ownership, obits on the other Boardmans if possible to see how they might relate, probates/estates and more. This entry was posted in BOARDMAN Surname, California, Daisy Emily Alice Colbeck, Edmund and Charlotte (McMurray) Boardman, Jean I. Miller, Los Angeles County, Margaret Boardman, McMURRAY Surname, Pasadena, PAST GENEALOGICAL RESEARCH TRIPS, Robert R. Boardman, Ruth Williams, San Diego & Los Angeles 2004, William Edmund Boardman, William Thomas Boardman and tagged Albert and Florence Boardman, Boardman Drug Store 1924, City directory research, Los Angeles Public Library, Pasadena California on November 21, 2012 by BJ MacDonald. William and Alice Boardman’s Family! William Thomas Boardman married Daisy Emily Alice Colbeck on 6 July 1908 in Vancouver, British Columbia. I had only the index information but not their marriage record. Here is that source. Source: Marriage Record for Wm. T. Boardman and Daisy Emily A. Colbeck, 1908, British Columbia Archives website, Reg #1908-09-055705, Roll # B11374, GSU #1983702, Result #5 in Marriage Index, Feb 19, 2003. Recently a very kind reader sent me a link to the Royal BC Museum where they are placing BMD’s online. You can use the above link to find the actual marriage record for William and Alice from the Royal BC Museum. As you will recall, I presented William and Alice’s naturalization in the last post. Alice stated she was born in Vancouver, B.C. (not WA) on her Naturalization paper and signed it. This marriage record above states that she was born in Sydney, Australia. So there is this interesting discrepancy in the birth location of Daisy Emily Alice Colbeck Boardman and what does it mean? It is probably an interesting story. The marriage record provides the name of her parents so that is a nice piece of information. Again thanks to my kind helpful reader. According to their Certificate of Arrival the couple migrated to the U.S. arriving on 10 Dec 1919. I have featured the 1920 Census for William and Alice in a past post showing that they were living in Pasadena, Los Angeles County, California by that time. 1. William Edmund Boardman born 2 April 1914 in Canada, probably Vancouver, B.C. and died 29 September 1979 in Atascadero, San Luis Opispo Co., California. He was buried there on 2 Oct. 1979 and according to Find A Grave he is in the Arroyo Grande Cemetery, Section L. They did not have a photograph of the tombstone but I am getting closer to that goal. William married a Jean I. Miller. I do not know if they had any children nor what happened to Jean. It is possible that William E. was married before to a Margaret per Pasadena city directories. Term of Enlistment: Enlistment for the duration of the War or other emergency, plus six months, subject to the discretion of the President or otherwise according to law. Civil Occupation: Tracktor Driver* or Truck Driver, Heavy or Chauffeur or Truck Driver, Light An asterisk (*) appearing after a job title indicates that a trade test for the particular occupation will be found in the United States Employment Service Manual, Oral Trade Test. Marital Status: Married, Height: 66, Weight:103. The weight of 103 seems way too low but that is what the record states. I am wondering if it should have been 130 for his brother is 134. William Edmund Boardman (son of Wm. T.) died on Sept. 29, 1979 (hse 0620) at age 65. His date of birth was April 2, 1914. He was born in Canada. His mother was Daisy Colbeck also born in Canada. He was a citizen of the USA. SS#____. He was married to Jean I. Miller. His occupation was repairman and he was 30 years in this business. Employed at Price Business Equipment doing typewriter repairs. He lived at 1920 So. McClelland Street, Santa Maria in Santa Barbara Co., CA. He died at the Arroyo Grande Community Hospital in the county of San Luis Opispo at 345 So. Halcyon Road, Arroyo Grande, CA. His spouse Jean I. Boardman was living at 1920 So. McClelland St., Santa Maria, CA 93454. He died of carcinoma of the Pancreas. Death was not reported to the coroner but an autopsy was performed. He was cremated on Oct. 2, 1979 at the name and address of the cemetery is Chapel of the Roses, Atascadero, CA. Not embalmed. The funeral director was Wood-Voakes Mortuary. Source: Certificate of Death, State of California Dept. of Health Services, #79-118471, Local Reg District 4000, Certificate #908. 2. Robert R. Boardman, born about June 1917 in Canada, probably Vancouver, B.C. and died 14 August 2004, Las Vegas, Clark Co., Nevada. He married 26 May 1938 in Pasadena, Los Angeles to a Ruth Williams. They had at least one son named Jimmy. He is also listed in the U.S. World War II Army Enlistment Records 1938-1946 at Ancestry.com. The 1940 U.S. Federal Census reveals that Robert is now the head of the family. Boardman, William, father, 3, M, W, 53, m, No, H1, 9, California, Al, same place, No, XOV1, yes —–1, 57, druggest, drug store, V30, 70, 1, 52, 1700. Source: 1940 U.S. Federal Census, Pasadena, Los Angeles County, California. No farm in district, Ward #48AD, Block 7 & 8, [Lominda Park], SD#11, ED#19-538, Sht. #8-B, April 10, 1940, Grace May MacKnight enumerator. As you can see, Robert and Ruth are living with William Boardman, Robert’s father but there is no mention of Alice his mother nor his brother William. I tried to get a death record for my cousin Robert but Clark County Vital Records in Nevada turned me down because I was not close enough in the family lineage. He is my cousin and I needed to be a direct family member. I wanted to verify that it was him and his death certificate would have helped. I also tried for an obituary notice from the newspaper at the local public library in Las Vegas but was again disappointed because they didn’t have anything on him. 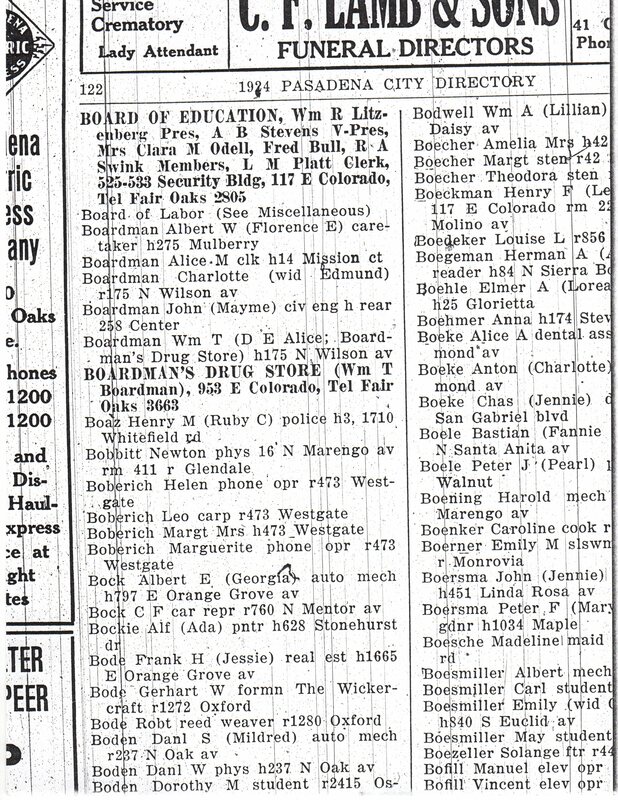 Source: Pasadena Newspaper, by Lu Spehr, News of Men in Service, Robert R. Boardman, June 23, 1945 page 9. Except that he’s on a seven-day week and has a lot more work to do, the war hasn’t made as much of a change in Corp. Robert R. Boardman’s life as it has in most servicemen. At an Air Service Command base in England he’s repairing typewriters and adding machines the same as he was before the war when he worked for the J.A. Freeman Company here. Corporal Boardman entered service Jan. 4, 1943, and trained at Atlantic City, N.J. Drew Field Tampla, Fla., and Gulftport, Miss., before going overseas Oct. 18, 1943. He was one of the ground crew boys doing the essential but unheroic work, who recently was taken on a sight-seeing trip by air over Germany to view the remains his flying buddies had made of Naziland. He has had three furloughs since he has been in England, on one of which he toured Ireland, another Scotland, and the third England. He wears the Presidential Unit Citation ribbon awarded his group for an outstanding mission over Germany. Corporal Boardman was born in Canada 28 years ago and has lived in Pasadena 26 years. He is a graduate of Muir Tech High School and was married May 26, 1938, to Ruth Williams who with their 2.5 year old son, Jimmie, lives at 367 Martelo Avenue. Mrs. Williams two brothers Pfc. Raymond H. Williams and Charles Robert Williams, seaman 2nd class, also are in the service. They are sons of Mr. and Mrs. R.E. Williams 335 South Los Robles Avenue. Raymond entered service March 5, 1943 and trained at Camp Roberts…” the article stops here. As I write these posts I contemplate all the research I still have to do and add to my To Do list, but that is the nature of genealogical research which needs time, attention, money and focus. William and Alice’s family are still in need of more attention. What is on the wish list, well, a picture of both of their son’s tombstones and the cemetery they are in would be nice. This entry was posted in Arroyo Grande Cemetery, Atascadero, BOARDMAN Surname, British Columbia, California, Canada, Clark County, Colbeck Surname, Daisy Emily Alice Colbeck, Edmund and Charlotte (McMurray) Boardman, Jean I. Miller, Jimmy Boardman, Las Vegas, Los Angeles County, Nevada, Pasadena, Robert R. Boardman, Ruth Williams, San Diego & Los Angeles 2004, San Luis Opispo County, Vancouver BC, William Edmund Boardman, William Thomas Boardman and tagged Atascadero, Boardman's Drug Store, California Freeways, Los Angeles Public Library, Pasadena Public Library, U.S. World War II Army Enlistments on November 11, 2012 by BJ MacDonald. Willie and Alice Boardman Naturalize! My research has led me to discover that William (Willie) and his wife Alice had migrated to Pasadena, California. I had discovered in my study of the family reunion photographs of 1924 that Charlotte Anne Boardman came down from Seattle to Pasadena with Robert and Ethel Boardman’s family. She then remained behind to live with Willie and Alice. The 1920 U.S. Census established that Willie and Alice were living in Pasadena and the 1930 U.S. Census also placed them there along with Charlotte. “Our goal was to drive up to San Juan Capistrano and stay there for two nights while I did research at the Laguna Niguel, NARA (National Archives) Pacific Branch. They actually had two in California. There is another in San Francisco. It took about two hours to drive up the coast from San Diego and it was in pretty heavy traffic. Fortunately, we left a little early and were able to get through without too much trouble. We found our Best Western in San Juan Capistrano right off I-5 to the East. The next day we were up fairly early to go to the NARA facility at Laguna Niguel which was only ten minutes from our hotel in San Juan Capistrano. This facility looks like a layered cake with a large base and sections growing smaller as it goes up. It was painted a funny yellow. It looked like it might have been a bomb shelter or government facility other at an earlier time. The security man did not know what it was intended for when we inquired. The research room was large and nicely set up with plenty of space to move around. They were more casual in their rules than the Seattle NARA facility as well as bigger. I cruised around and grabbed information sheets and studied what they had in this facility. I started looking at Los Angeles and Pasadena city directories on microfilm. Apparently they had these films because of the 1930 U.S. Census needing address and location information to assist people in finding a person. They only had from 1928 to 1931 for Los Angeles and Pasadena in the directories. I asked at the desk and found them very helpful and very friendly. The assistant gave me a handout of different research facilities in the Los Angeles area and he also told me that the Los Angeles Library had a very good supply of City Directories from all over the US. He showed me the list. 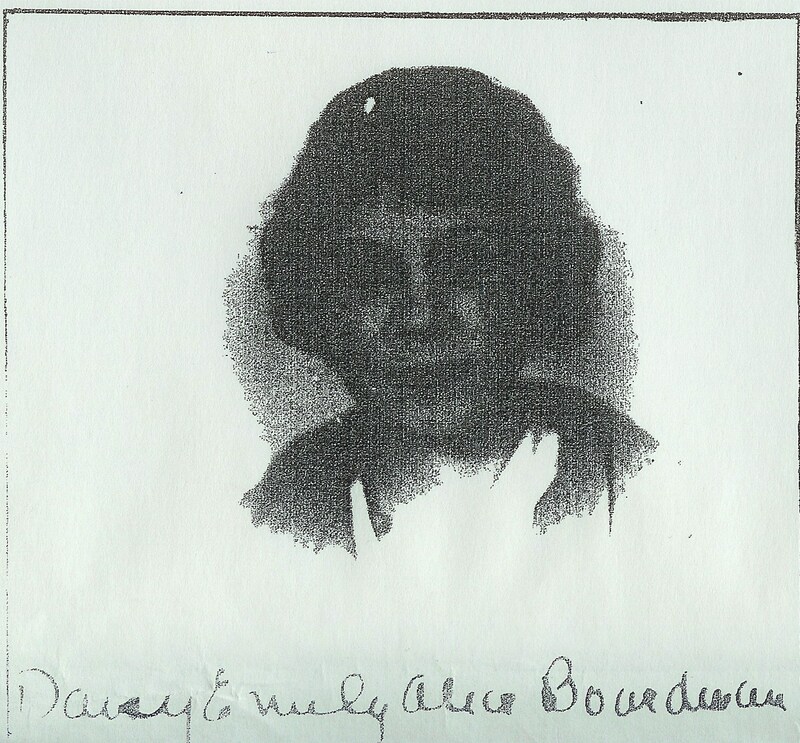 My task was to find naturalization papers for William T. Boardman and his wife Alice. It took a little time to figure out the microfilm reels. Fortunately for me they had a handout that explained how to do naturalization research and that was of great benefit. At first I thought I had the wrong microfilm reel because it said San Diego not Los Angeles on it but I did find William T. and Alice in the index and wrote all that down and then I was able to locate their naturalization papers which were on another microfilm. They were not the originals but copies. This meant that the photographs of them were not going to print very well on the microfilm reader/printer, so I was going to have to do the best I could. As always, some good information is found and other information just adds to the puzzle. In this case, I learned how they came into the US and it was through Blaine, WA by the railroad (difficult to say) and it really didn’t say how they got to Los Angeles. There was the use of the term RR or RY and I am not sure what that means. Alice’s name is written as Daisy Emily Alice Boardman. No wonder I can’t find her in the death records. The place of her birth is still a mystery. The census says Australia but in her naturalization papers it says she was born in Vancouver, BC and they married there as well. It did not say who their parents were but it did confirm that William T. was born in Winnipeg, Manitoba. The papers described their children. According to their Certificates of Arrival they entered the United States at Blaine, Washington on Dec. 2, 1919 via RR. How they migrated further to California is not clear. Source: Certificate of Arrival for Wm. T. Boardman, US Dept. of Labor, #23-28811, arrived Dec. 2, 1919, signed October 9, 1935. Certificate of Arrival for Daisy Emily Alice Boardman, Certificate #23-28810, arrived Dec. 2, 1919, signed Oct. 21, 1935, U.S. Dept. of Labor. 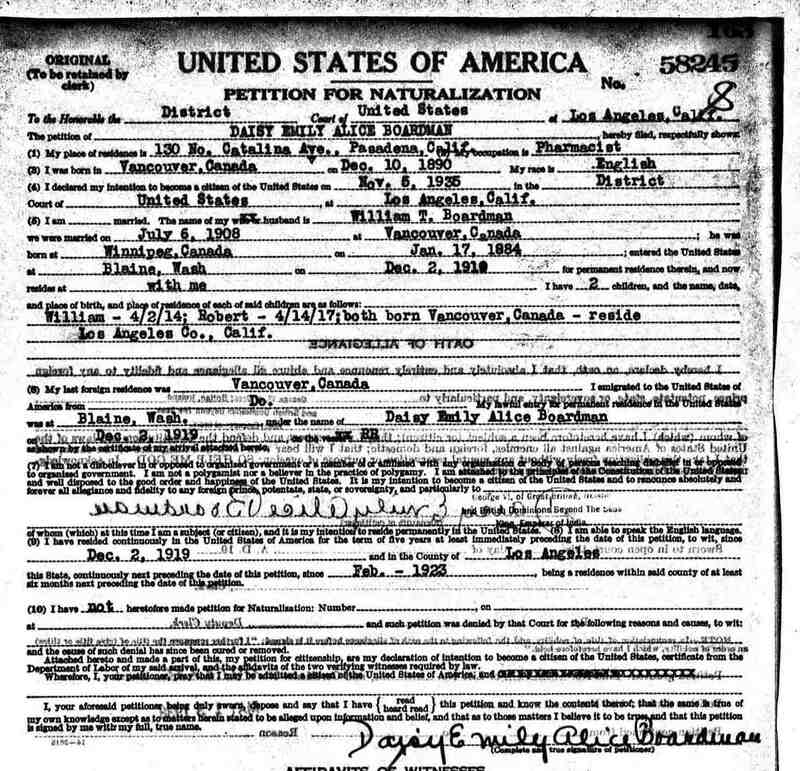 In 1935 Willie and Daisy both applied for their Declarations of Intention and received their naturalization by 9 Feb 1938. These were microfilmed copies so the quality of the photographs is not that good but still gives an idea of how they looked. Declaration of Intention for William T. Boardman, residing at 130 No. Catalina, Pasadena, CA. Occupation is retail druggist. Aged 49, male, white, complexion is dark, eyes are blue, hair is dk. brown, height is 5 ft, 6 inches, weight 150 lbs. with a scar on the chin. His race is English, nationality British. Born in Winnipeg, Canada on January 17, 1884. He was married on July 6, 1908 in Vancouver, Canada. His wife’s name is Daisy. She was born on Dec. 10, 1890 in Vancouver, Canada. They entered the US at Blaine, WA on December 2, 1919 and he now resides in Pasadena, CA. He has 2 children who reside with him Wm. born on April 2, 1914 and Robert born on April 14, 1917. Both children were born in Canada. Signed in Los Angeles, Calif. on the 5th day of November, 1935 Certificate No. 23-28811. They came into the US on the vessel Ry. Source: #73435, Nov. 5, 1935, Vol. 126, Pg. 35, #M1525 I20 (Cabinet VI) 1915-1930 1st Draw, Los Angeles District Court, U.S. Department of Labor, Pacific Region – NARA. #58246 (pg. 164?) Petition for Naturalization for William Thomas Boardman, living at 130 No. Catalina Ave., Pasadena, CA. Occupation druggist. Born in Winnipeg, Canada on Jan. 17, 1884. He is of the English race. Declared Intention on Nov. 5, 1935 in the District of the US at Los Angeles, CA. His wife is named Daisy and they were married on July 6, 1908 at Vancouver, Canada. She was born in Vancouver, Canada on Dec. 10, 1890. They entered the US at Blaine, WA on Dec. 2, 1919 and she now resides with him. He has 2 children. William born 4/2/1914 in Vancouver, Canada and now lives in Alhambra, CA. Robert was born 4/14/1917 in Vancouver, CA and lives with him at this time. His last residence was Vancouver, Canada. He entered the US at Blaine, WA by RR on Dec. 2, 1919 and now lives in Los Angeles County, presiding Feb. 1923. He signs it as William Thomas Boardman. His witnesses are Edward Roeth a plumber who lives at 35 So. Wilson Ave., Pasadena, CA and Harold Surber a State Humane Officer residing at 931 E. Grand, San Gabriel, CA. Signed on Feb. 9, 1938 in the Court of Los Angeles, CA #23-2881 and #73435. U.S. District Court in Southern District of California. Source: #58246, Feb. 9, 1938, Vol. 237, Pg. 164#M1525, I20 (Cabinet VI) 1915-1930 1st Draw, U.S. Dept. of Labor Index, Petitions #1524 58038-58485 Roll #216, Los Angeles Court 1887-1991, Pacific – NARA. Daisy Emily Alice Boardman declares her intention of becoming a U.S. citizen. She is residing at 130 No. Catalina, Pasadena, CA. She is an Asst. Pharmacist. She is 42 years old, female, white with a dark complexion, brown eyes, brown hair. She is 5 ft, 8 inches tall and 130 lbs. She has no visible marks. Her race is English and nationality is British. She was born in Vancouver, CA on December 18, 1890. Her husband’s name is Wm. Boardman and they were married on July 6, 1908 in Vancouver, Canada. He was born in Winnipeg, Canada on Jan. 17, 1884. They entered the U.S. at Blaine, WA on December 2, 1919. She has two children and they reside with her. Wm.E. 4/2/1914 and Robt 4/14/1917 both born in Canada. She came to the U.S. by way of “Ry.” #23-28810. District Court of the U.S. of Los Angeles, Southern District of California, Co. of Los Angeles. Petition for Naturalization for Daisy Emily Alice Boardman residing at 130 No. Catalina Ave., Pasadena, CA. Occupation is a Pharmacist. She was born in Vancouver, WA B.C. on Dec. 10, 1890. Her race is English her nationality is British. She declared her intention to become a citizen on Nov. 5, 1935 at the District Court of the U.S. in Los Angeles, CA. Her husband’s name is Wm. T. Boardman and they were married on July 6, 1908 in Vancouver, Canada. He was born in Winnipeg, Canada on Jan. 17, 1884. They entered the U.S. at Blaine, WA on Dec. 2, 1919 and he resides with her along with their 2 children, William 4/2/1914, Robert 4/1/17, both born in Vancouver, Canada and reside in Los Angeles, CA. They came into the U.S. by “RR.” Her witnesses were the same persons as her husband Wm. T. Boardman’s. Source: #58245, #M1525, I20 (Cabinet VI) 1915-1930 1st Draw Index, Petitions M1524, 58038-58485, Roll #216, U.S. Department of Labor, District Court of the U.S., Los Angeles, CA, Pacific NARA. Both declared their allegiance to the United States through their Oaths of Allegiance. From these documents we learn a lot about William, Alice and their children. If you have a subscription to Ancestry.com you can view these documents online under their “U.S. Naturalization Records – Original Documents, 1795 to 1972 (World Archives Project)” rather than go and visit the NARA branches, although I do have to admit they are an adventure to find and a joy to visit. The other option is to figure out what branch of NARA the papers are housed at an order a copy online. This entry was posted in Blaine, BOARDMAN Surname, British Columbia, California, California February 2003, Colbeck Surname, Daisy Emily Alice Colbeck, Edmund and Charlotte (McMurray) Boardman, Los Angeles County, Manitoba, McMURRAY Surname, Pasadena, PAST GENEALOGICAL RESEARCH TRIPS, Robert R. Boardman, San Diego & Los Angeles 2004, Updates and Corrections, Vancouver BC, Washington, Washington, William Edmund Boardman, William Thomas Boardman, Winnipeg and tagged Declaration of Intention, druggist, NARA Laguna Nigel branch, Naturalization, Pasadena, Pharmacist, San Juan Capistrano on October 25, 2012 by BJ MacDonald.